A visitor to the Axiom message boards was recently contemplating sawing a chunk out of his 24-inch wooden stands in order to “get the tweeters of his M22ti bookshelf speakers exactly at ear level.” While positioning bookshelf speakers so that the tweeter is roughly within a reasonable visual line with your head or ears is recommended, such drastic action with a saw usually isn't required. 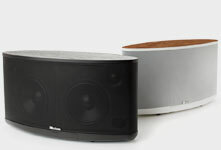 The high-frequency radiation of the 1-inch titanium-dome tweeter used in the M22ti, M2i and M3ti bookshelf speakers (and all of Axiom's speakers) is wide and consistent. Our "listening window" measurements of frequency response show that the tweeters' off-axis response at 15-degree angles is very similar to the on-axis response. Reflections from room surfaces will significantly widen the listening area beyond the anechoic measurements in most rooms. So you don't need to absolutely align the tweeter with your ears. 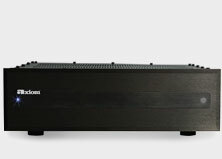 According to Ian Colquhoun, Axiom's founder and chief designer, the speaker's frequency balance will not begin to audibly change due to the speaker's dispersion characteristics until you are beyond a 30-degree angle away from the front of the speaker. This raises the issue of what height stands to use. 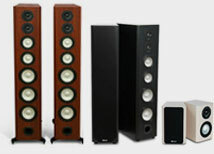 In most installations, at a reasonable listening distance of 8 feet or more, using 16-inch or 24-inch-tall stands with the M3ti, M2i, or M22ti's only raises (or lowers) the soundstage. 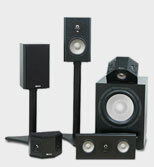 If you use your speakers in a home theater setup, you also want the front speakers' sonic soundstage to be reasonably consistent with the visual image, so consider the relative height of your video display when you select speaker stands for bookshelf speakers. I have found no significant difference in the transparency or quality of the sound using 16-inch or 24-inch stands. But personal preference also comes in to play. For reasons I've never fully understood, I don't like sitting in balconies, looking downwards on a performance or performers. I'm more accustomed to being seated on the main floor of a theater, watching the performers on a stage at the same level or slightly higher up. Even as a teen-ager (apart from the balcony hi-jinks), I never liked looking down at a movie screen. Consequently I like the soundstage even with or a bit higher, and 24-inch stands accomplish this. Finally, if you worry about large dogs or toddlers knocking over stand-mounted bookshelf speakers, Axiom's new line of FMS metal stands use a clamping mechanism that won't mar the speaker's finish. Older stands can usually be modified to hold the speakers in place on the stand by using a non-marring adhesive putty like Blu-Tak or museum putty underneath the speaker.